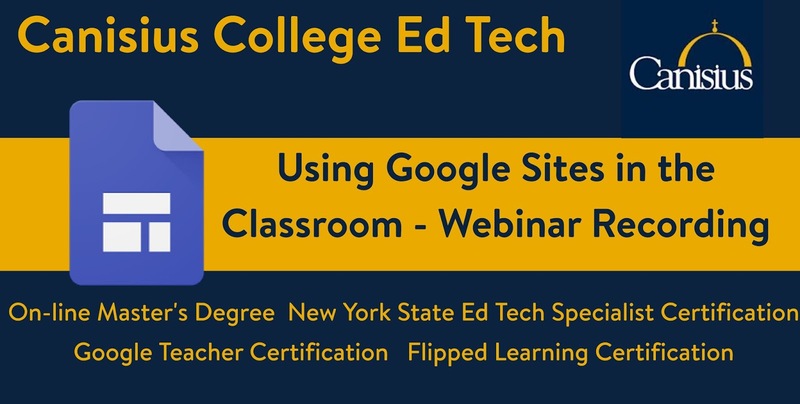 This recorded session explores how to create websites using Google Sites. This is an introductory session that helps educators learn how to use this tool with their colleagues and students. Participants will guided on how to create and name a Site, navigate the menu options, share a Site, design a Site, use templates, and publish a Site. Classroom project ideas will be modeled. Consider taking a course this summer or fall in our online Ed Tech Program. Classes provide teachers with innovative and practical tools that can immediately transform their classrooms. Each 3 credit hour course is equivalent to 45 CTLE hours! Visit our program website that explains the various courses and expectations of the program. The Education Technologies and Emerging Media Programs are innovative and fully online. The Master's Degree program is designed to prepare classroom teachers for New York State (NYS) certification as an Educational Technology Specialist (grades PreK-12). A degree option is also available for students not interested in NYS certification. 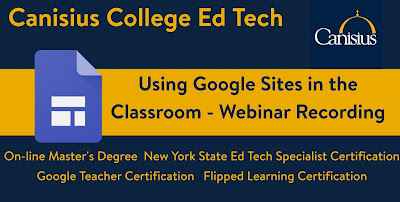 These courses also prepare students to take the Google Certified Education Level 1/Level 2 and Flipped Learning Level 1/Level 2 Certification exams. This program is perfect for K-12 teachers who already have their initial certification in their content area and are seeking professional certification. Students focus on the purposeful use of technology for teaching and learning with a major emphasis on the application of technologies for content literacy.